Many people have different uses for lanyard holes on a knife. This is how I use a lanyard hole more often than any other. Especially with bushcraft knives, sheaths are made to cover most of the handle. There is usually just a little bit showing to allow you to pull the knife out. When you have large hands or are wearing gloves, this can be a pain in the rear end to deal with. It is easier than many other retention systems such as snaps, straps or toggles. Here is how the normal bushcraft knife looks in its sheath. This pictures does have a leather lace started in the lanyard hole. As you can see, there isn’t that much available handle to get bear sized paws on. I build myself a leather “toggle” as I call them. This is what it looks like when I am done. As you can see in the pictures, I not only have a good deal of leather to use in pulling the knife out of the sheath, but I can also use that leather to allow me to choke down on the handle for chopping. Since it slides to create a larger loop if desired, I have also been known to wrap my wrist so I can loosen my grip when carving or processing firewood. Although many of you see this knot and already know how to tie it, I figured I would give those that don’t a little tutorial. The first thing I do is pass the lace back in upon itself to make a loop. It should look like this. I then wrap the free end around the bottom of the loop to build something similar to a noose. When you get the desired number of wraps just pass the free end back through the top of the loop and slide everything together to make a tight knot. Make sure you keep everything tight and slide the free ends down upon itself to make the cleanest knot possible. You don’t want the knot coming loose. I have seen people put epoxy over knots like this, but I don’t recommend it. If you keep everything tight and clean there should be no issue during use. Sometimes knots do slide loose. If that happens to you, then just retie it. It really isn’t a big deal. Over the years I have seen a multitude of different knots used. It really doesn’t matter how you put this together, in all actuality. The big thing to remember is that the lanyard hole on a knife can be used. So many people just ignore them and complain when they have problems drawing their knife or with their knife slipping while chopping. Remember that these knifes are tools like any other tool. Use them and their features as intended when needed. This entry was posted in Classes/Education, DIY Projects, Edged Tools and tagged bushcraft knife, custom knife, lanyard holes, leatherworking, Skab leatherworks, SPL, SPL Knives on April 5, 2016 by Woodsbum. I have been looking for a good tobacco pouch that really just screams “outdoorsman” for a while. Since I was in the process of having a sheath built for my son’s custom hunting knife, I asked the maker (Skab from BushcraftUSA) to make me a pouch. This is what he came up with. I wanted something that was about 3 x 5 inches in size with a draw string and some fancy tidbits on it. Of course dark colored leather is one of my favorite colors, so that was a must as well. What Brandon came up with was quite remarkable. 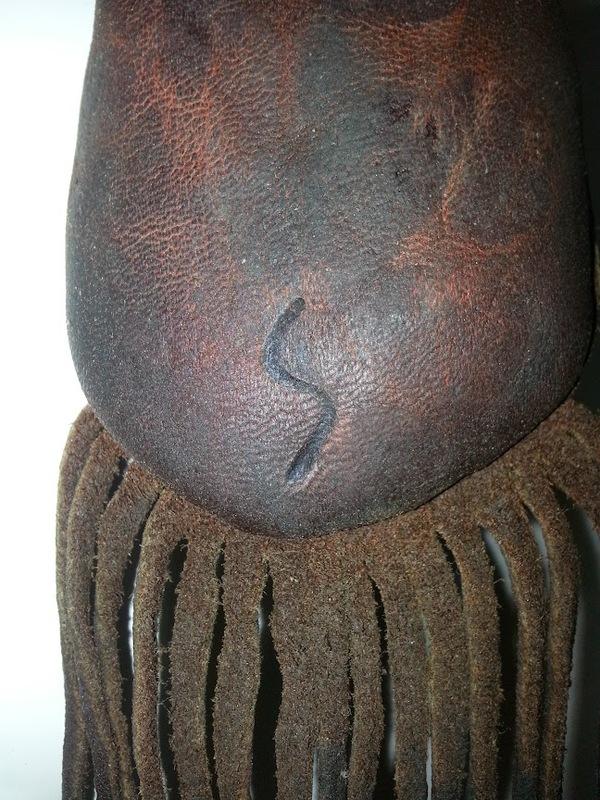 It is an elk hide pouch that was rubbed down with rendered bear fat to give it the worn look. 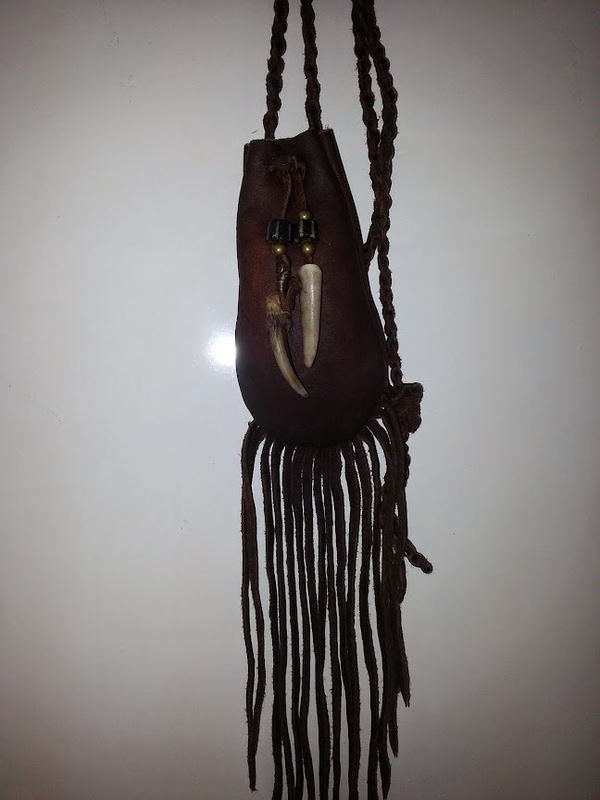 The claw is from a badger and the other dangle is a piece of antler. The cordage is leather and done in a 2 strand twist style for appearance as well as strength. The overall effect is quite nice and I love the style. This is how I will be carrying my pipe tobacco to the field from now on. It really is quite amazing work. If you want to get in touch with Brandon, you can hit him up on BushcraftUSA.com in his vendor forum. His prices are quite reasonable considering each item he does is a one off in a custom design. If you run across this maker’s mark, you know it is quality and handmade. Make sure to hit him up if you need something that is quite rustic and antique looking. He works in leather and rawhide. 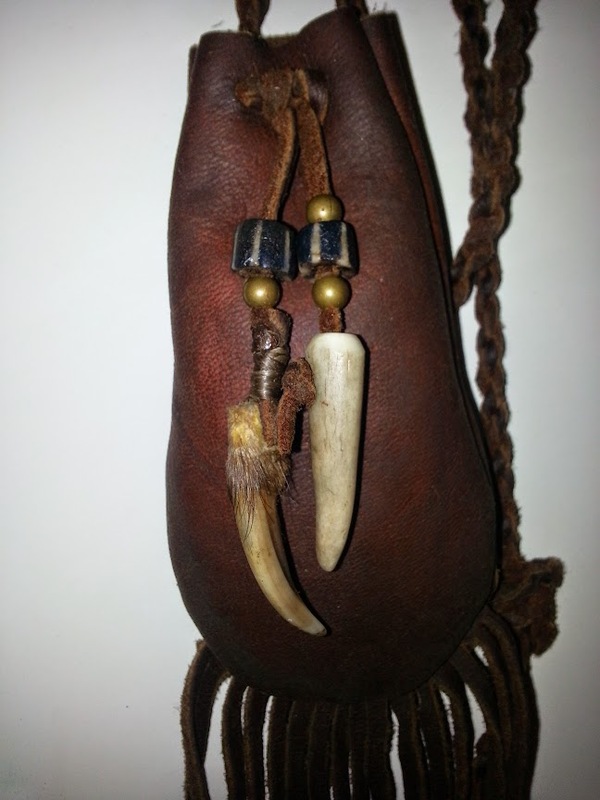 This entry was posted in Miscellaneous and tagged custom leatherwork, elk hide, leather pouch, medicine pouch, Skab leatherworks, tobacco pouch on April 7, 2015 by Woodsbum.